After praying, he lay quietly listening to the enemy begin to draw close. He thought, "Well, I guess the Lord isn't going to help me out of this one." 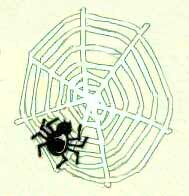 Then, he saw a spider had begun to weave a large web over the front of his cave. As he watched, listening to the enemy searching for him all the while, the spider quickly layered strand after strand of web across the opening of the cave. "Hah," he thought, "What I need is a brick wall, and the Lord sent me a spider web. God really does have a sense of humor." "Lord, forgive me," prayed the young man. "I had forgotten that – in You – a spider's web is stronger than a brick wall." We all face times of great trouble. When we do, it is so easy to forget how God can work in our lives, sometimes in the most surprising ways. Remember that with God, a mere spider's web becomes a brick wall of protection. "Thank you, Mark, for this truly inspirational tribute!" Of all the gifts we could give a US Soldier, prayer is the very best one. "Lord, we pray that you send your brick wall of safety for our troops every day! Hold each US Soldier, Sailor, Marine and Airman in your loving hands as they fight to protect us and others. Bless them, and bless their families, for the selfless acts they perform for us and our country." To face whatever is to be. that has no heroes . . .
©Copyright 2006 by SaintnowhereMountainwoman, Inc.